I blame my getting into Les Mis on a few things: my cousin Laura, Elizabeth, someone on my old Livejournal, and everyone in Dartmouth, NS who went to see Skyfall of December 26th, 2012. Which sounds strange, I realize, but bear with me. We were visiting family in Halifax that Christmas, and on Boxing Day we decided to head to the movies. My cousin Laura is a big theatre fan (and a theatre director herself! ), and she along with most of my family were going to Les Mis. She was super excited about it, but I didn’t know anything about it (beyond vague knowledge that it’s a Broadway musical about historical France) and had little interest. So Dad and I were going to go see Skyfall, but when we got to the theatre it was sold out and we decided to tag along to Les Mis. I know these stories usually end in “I came out of the theatre in love and was instantly a huge fan”, but it’s not really true. I enjoyed the movie a lot and was glad I went, but then I mostly forgot about it until one year later when someone on my LJ randomly posted about the movie and linked to some Valjean/Javert fic. I ended up rewatching the movie, reading a TON of fic over New Years 2013/14 (I think I read around 200,000 words over the course of a few days), and getting completely hooked. Since then I’ve seen it live on the London stage (approximately five hours after my plane landed after a 9-hour overnight flight from Vancouver, I was very tired), live in Vancouver last summer, and have listened to the 10th Anniversary Concert soundtrack approximately a billion times (or at least certain songs). Seeing it on the London stage utterly blew me away, even though I almost fell asleep during “I Dreamed a Dream” (I was really tired ok). You could have heard a pin drop in the audience during “Stars”, it was mesmerizing. Anyway, the reason I blame Elizabeth although she wasn’t involved in me originally getting into it, is because she’s my main Les Mis fan friend and totally helped to enable my growing obsession 2 years ago. 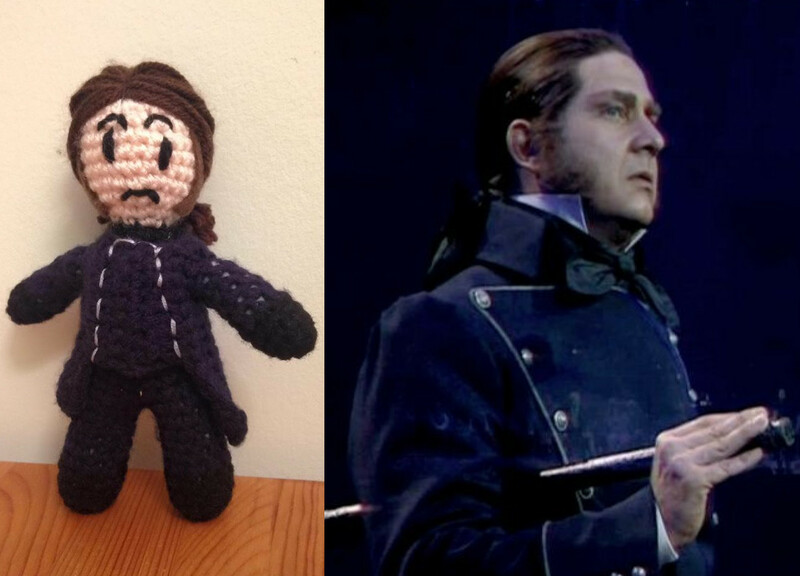 😉 As thanks, I made her these little Valjean and Javert dolls for her birthday last year! They’re based on the stage version rather than the movie version, mainly the Wilkinson & Quast versions. I do still enjoy the movie, but after seeing it on stage and listening to the 10th Anniversary Concert soundtrack so much, I find it hard to listen to Russell Crowe… I do think he does a good job of acting the part and bringing emotion to the role, but his singing voice just isn’t that strong. Nothing can really compare to Quast’s version of “Stars”, though! 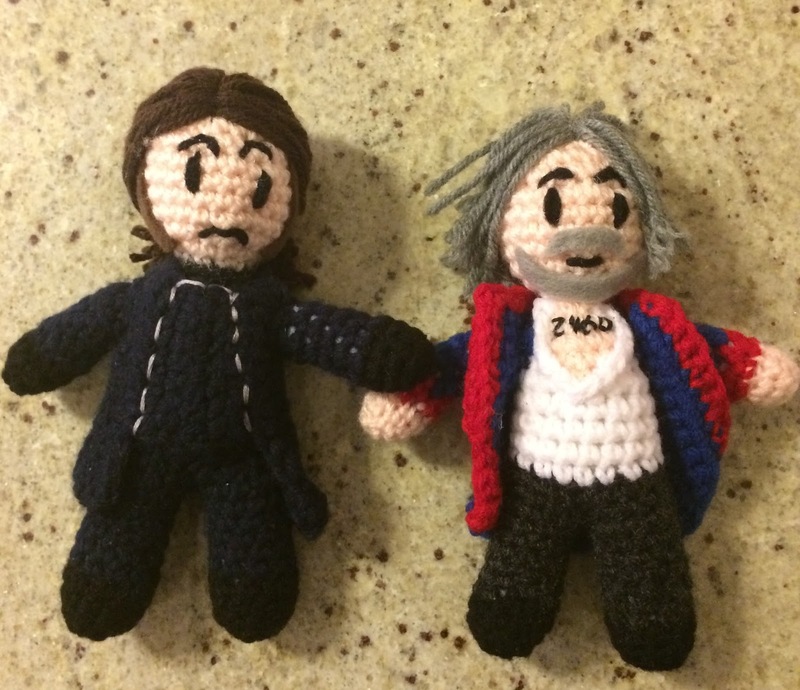 And as a bonus, check out below what she made for me in return last month for my birthday! So cute!! Cross stitched pixel art of Valjean and Javert, I love it! Ok that’s all from me tonight – coming soon, the much overdue Baby Groot in Naramata post!